If you need evidence that Wall Street is a financial time bomb waiting for ignition look no further than the recent meltdown of Valeant Pharmaceuticals (VRX). Its market cap of $90 billion on August 5th has plunged to less than $12 billion by Wednesday’s close. That’s nearly a90% haircut and VRX was no microcap penny stock. It was a giant favorite of hedge funds. On a single day last week, hedge funds lost $5.3 billion in value. Fitting justice, some might say, for the likes of rank gamblers like William Ackman (Pershing Square) and Jeffrey Ubben (ValueAct Holdings) who lost $700 million each that day. The fact that they have successfully promoted themselves for so long as masters of the universe, however, is the real moral of the story. The financial markets and media have been so corrupted by central bank bubble finance that they did not even recognize that Valeant was a monumental scam and that Ackman and Ubben are snake oil salesman in $5,000 suits. Presently, it will become clear that the hedge fund hotels are heavily occupied by many more of the same. No, Valeant wasn’t caught selling poisoned pills or torturing kittens during the last seven months. What it was doing for the past seven years — aggressively pursuing every one of the financial engineering strategies that are worshipped and rewarded in the Wall Street casino — finally came home to roost. Valeant’s evolution during that period arose straight out of the financial engineering playbook. It was a creature of Goldman Sachs and the various dealers, underwriters, hedge funds and consulting firms which drive the Bubble Finance trade. At the end of the day, they’ve turned the C-suites of corporate America into gambling dens by attracting, selecting and rewarding company-wrecking speculators and debt-crazed buccaneers to the top corporate jobs. In this case, the principal agent of destruction was a former M&A consultant from McKinsey & Co, Michael Pearson, who became CEO in 2008. They brought an opportunity to slash thousands of jobs, eliminate R&D and fund massive amounts of goodwill and intangible assets with cheap debt. Valeant not only failed to acquire any significant pharmaceutical developments, but actually went in the opposite direction. That is, it militantly eschewed investment in drug research and development in an industry who’s very purpose is the development of new drugs and therapies. Yet the alternative strategy they peddled to the occupants of the hedge fund hotel could only have thrived during the late stages of a Bubble Finance mania. In fact, Valeant acquired a reputation for ferociously raising prices. In one year alone the company jacked-up the price of 81% of the drugs in its portfolio by an average of 66%. Massive, wanton, overnight price escalation is not a business strategy that builds sustainable value. It’s a scalping tactic that works in the casino, but not the real world. Finally, this Wall Street witches’ brew was stirred together in financials that assumed these predatory price hikes would be permanent. The resulting profit projections, of course, had virtually nothing to do with the company’s actual results. Thus, in 2014 it earned only $912 million under generally accepted accounting principles (GAAP), but claimed “cash” earnings of $2.85 billion. That meant that at its peak market cap in mid-2015 it was trading at a sporty 32X earnings, but not really. It was actually being valued in the casino at 101X earnings. Needless to say, on the back of that kind of financial scamming, it did not take long to turn Valeant into a veritable debt-mule. Its debt outstanding rose from $400million in 2009 to $31 billion at present. That’s a 78-fold eruption of debt. 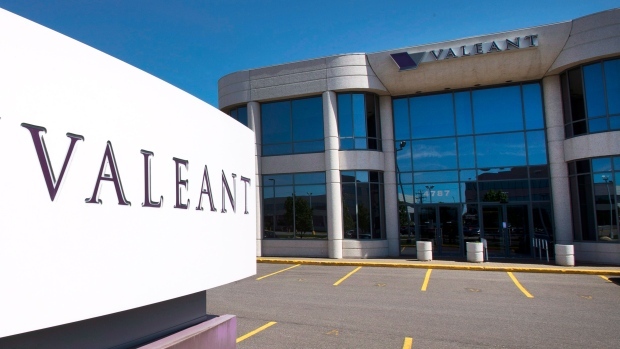 Valeant has been a veritable cash burning machine during its Wall Street driven M&A spree. During the 27 quarters since the end of 2008, VRX has generated a mere $7 billionin operating cash flow. But it consumed nearly $26 billion of cash on investments and deals. Stated differently, it was a Wall Street Ponzi pure and simple. It has been an absolutely profitless prosperity — not unlike the typical financial engineering driven roll-up. Over this 27 quarter period as a whole, sales totaled just under $30 billion. But its cumulative net income amounted to a miniscule $130 million. It was just another case of Wall Street financial engineering and speculative hype at work. It goes without saying, of course, that these Bubble Finance deformations have resulted from the lunatic cheap money and wealth effects levitation policies of the Fed.Financial repression and quantitative easing (QE) deeply subsidize corporate borrowing to fund financial engineering deals. Likewise, zero interest rates (ZIRP) are the mother’s milk of Wall Street speculation. It’s enabled hedge funds and other fast money traders to build-up positions in rocket ships like Valeant at virtually no cost through the options and dealer financing markets. But it’s no mystery why these financial engineering scams happen over and again in financial markets which have been corrupted and disabled by the Fed and other central banks. It’s because the deal fees from financial engineering are so lucrative. And because the checks and balance of a healthy free market in finance — such as short-sellers, heavy hedging expense and meaningful carry costs for debt financed speculations — have been destroyed by the central banks. Needless to say, Valeant is not a one-off aberration. It is the epitome of today’s speculation swollen and highly combustible financial markets. And the all-powerful central bank which has fueled this dangerous, unhinged casino is now being led by a Keynesian school marm stumbling around in an explosives vest. She apparently has no idea that a 0.38% interest rate doesn’t boost GDP. It’s an ignition fuse that is fueling the greatest speculative mania in modern history. 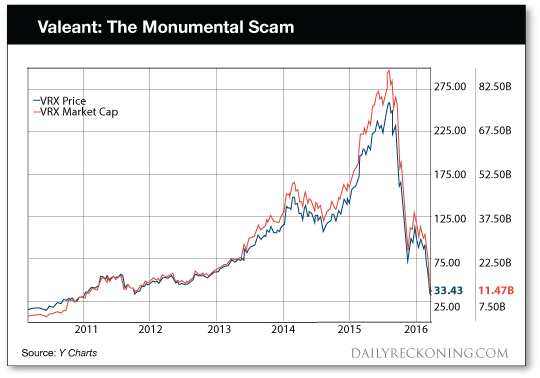 Valeant’s spectacular implosion is no accident. To the contrary, it’s the natural product of what the Wall Street casino does.